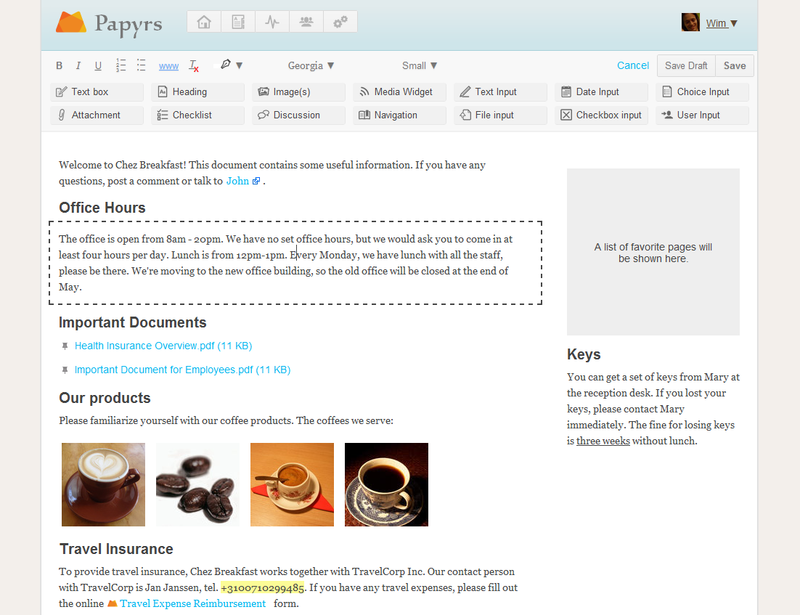 Over the past few months we have been adding many new features to Papyrs. This week we launched a design update and the Activity Stream. With a lot of different information going back and forth between team members, the Activity Stream is a great way to stay up to date with everything that’s happening in your team. Â You can find all the latest actions, post or view comments and status updates for everyone in your team or in a specific subgroup. Streams have been an important part of many modern social networks, and are also becoming an important way to communicate within businesses and organizations.Â It’s an easy way to get your announcements or questions & answers out to entire teams, without spamming and cluttering their Inbox. This also makes it easier for other people to reply on activity items, participate in discussions and keep people up to date about their progress. Because inactive discussions automatically ‘sink’ Â to the bottom of the stream, the stream is good central place for both having active discussions as well as posting about updates (like micro blogging socialÂ networks). Because the Activity Stream is fully integrated with the other functionality in Papyrs, any updates to pages and forms are automatically posted to the stream, and visible only to people with permission to view this type of activity. 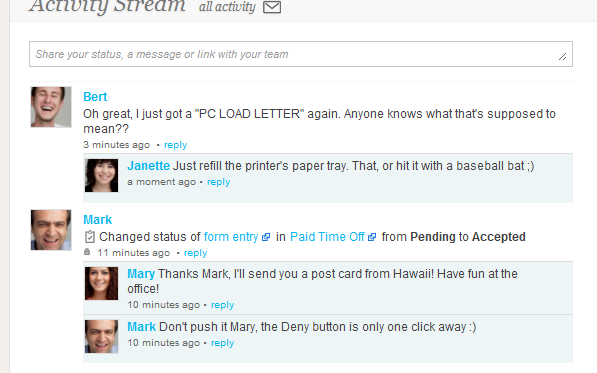 For example, when Mary submits an Expense Reimbursement form and Mark from Accounting denies the request, it will be visible for her in the Activity Stream and she can directly access the form to add that missing receipt. The Stream also supports sharing with and subscribing to items only within certain sub groups. It’s also possible to add a summary of recent activity to your pages using the Navigation widget, e.g. on your homepage. Finally, discussions on pages now also support replies on comments (threading), and new posts appear in the Stream as well. We also made some updates to the UI design of Papyrs, and added new buttons to the top of the page to quickly switch between the main parts of Papyrs (home page, page navigation, activity stream, people directory and settings). We hope you like the new look and features! 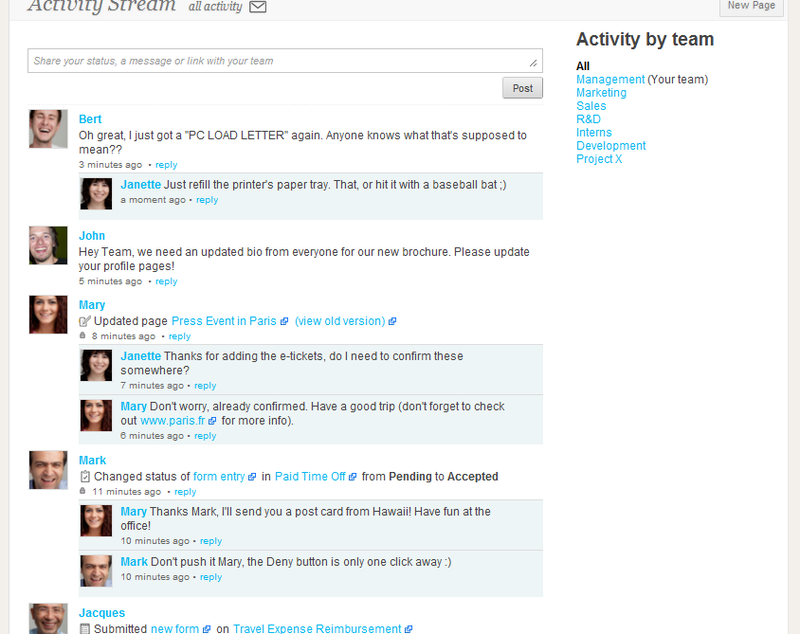 The Activity Stream is nice, especially as it is integrated with the various Papyrs functions. What seems to be surprisingly missing however from the current incarnation of Papyrs is Search. Any plans to implement this in the near future? We’re doing the last bit of testing on search. Search will be available to all Papyrs accounts in a couple of days, hopefully.